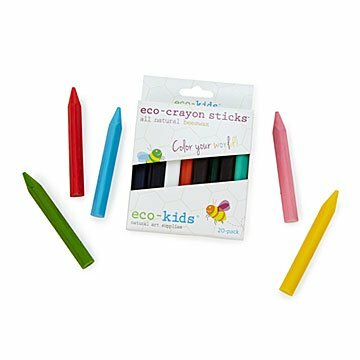 Your little can make creative strides using an all-natural alternative to traditional crayons. Parents Cammie and Kip Weeks had a mission: Could they create all-natural art supplies for their three children Jack, Maggie, and Gus? Using her mother's recipe for chemical-free "play" dough, Cammie added safe pigments and beeswax, and soon enough the first batch of eco-friendly crayons was born. Now your little one can make the world more colorful with this pack of 20 vibrant crayons. From blank page to coloring book, they'll take creative leaps using a safe alternative to traditional crayons. Handmade in Portland, Maine. It began simply, as all good things do, with the molding dough recipe Cammie's mom made for her as a child. Cammie and Kip wanted to give their kids the opportunity to play, create, and get messy, but they didn't want to have to worry about what's hidden in their art supplies. So, after incorporating natural ingredients into the recipe, the dough was transformed into eco-dough: Rich in color, soft in texture, and with a delicate aroma like no other. From there, the couple's business evolved. I gave only three stars because the box that I got looked like it was already used by somebody else. Also there are not too many bright colors. The yellow color cannot be seen when you draw on a white paper.